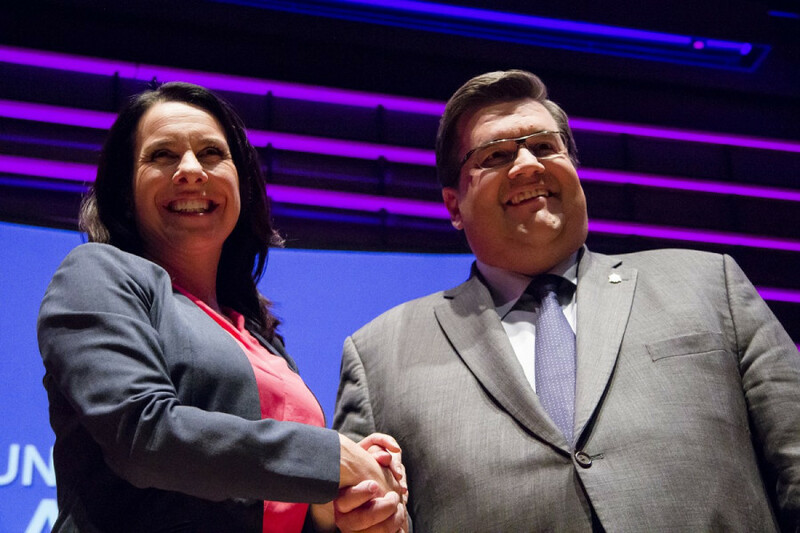 Mayoral candidates Valerie Plante and Denis Coderre faced off in a lively English language debate last Monday. With polls suggesting a close race and large margin of undecided voters, face-to-face confrontations have high stakes. With Coderre having a history of controversial policy and Plante emerging as a new potential leader, both candidates have a delicate relationship with public opinion. Plante has utilized her position as a new candidate to bolster ambitious plans. Coderre’s legacy may do just the opposite. In 2013, Coderre won the mayorship by a slim 32 per cent, and polling suggests that that may be the best case scenario for him come voting day. Struggling businesses on Bishop St., the pitbull ban, and expensive, and poorly organized Formula-E races are among the shortcomings that would make the coming election worrisome for the incumbent. In recent polling by Leger Marketing, Coderre and Plante are running neck and neck. However, about 20 per cent of those polled are still undecided. In search of answers, a buzzing crowd of students and locals filed into Concordia’s Oscar Peterson Hall to witness the theatrics. Unfortunately for Coderre, theatrics may be the last thing he needs. Some of the most controversial aspects of Coderre’s work in his first term have received attention because they provide the best headlines. Voters are much more likely to be aware of policies such as the pit bull ban over slight increases in tourism income and unemployment reduction. All of these topics are important and worthy of public awareness, but municipal repossession of the family dog can easily overshadow other, more pragmatic accomplishments, as it is by far the most attention grabbing. Valerie Plante knows this, and is using the same mechanism to bolster her climb into the public eye as a viable alternative to Coderre. Projet Montréal has built a platform with pillars of bold ambitions. This is the heart of the issue with public opinion. Plante’s ability as a new candidate to increase her exposure relies on her ability to propose new and contrary policies, whereas Coderre’s sensational decisions will always overshadow other accomplishments. Nord to downtown. The project, according to Plante, would move 250,000 commuters every day. Coderre failed to introduce any flashy contrast, sticking to plans introduced last term: increased investment in pre-existing services, continued development of the Service Rapide par Bus (SRB), and extension of the blue line. These are meaningful developments, but not as ambitious as the pink Zoro-slash on the metro map. The prospect of real change resonates with audiences, and it certainly did with the attendees of this week’s debate. Plante’s plans were rich with rhetoric around the importance of listening to Montreal voices, citing Coderre’s pit bull ban, Bishop St. construction, undisclosed Formula-E ticket sales, and spending on Montreal’s 375th as poor examples of municipal accountability. While accusing Coderre of being influenced by corporate interests, Plante stated she would hold a referendum to determine Montrealers’ interest in the construction of a baseball stadium. Intent to work in the interest of the public is imperative to leadership—but for conversation’s sake, we should question how that should be executed. Ambitious plans such as the Pink Line may be unnecessarily costly when an increase in investment in other aspects of the STM could provide a similar service at a fraction of the cost and time. A referendum to decide whether a baseball stadium should be built could be costly, and perceived as trivializing the trust put unto whoever the public elects as a leader. The resulting perception of both candidates is the same: exaggerated. This is not to say Plante is wrong, or has an unfair advantage, or that Coderre has been a perfect mayor other than a few slip-ups. There are people who stand behind Coderre’s decisions. This is not an endorsement of either candidate. What could improve is the publicity around more pragmatic policy and achievement, as opposed to increased coverage of reactionary, albeit attention grabbing, sensational politics. The by-product of reduced sensationalism could be meaningful voter awareness and political discourse.